The ball is back in ConocoPhillips’ court. 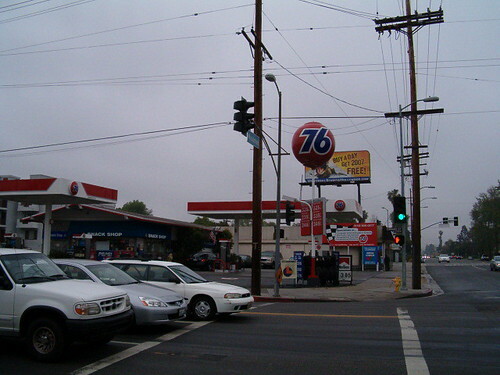 Two Los Angeles bloggers with a fondness for vintage California signs have launched a Web campaign to save the rotating orange and blue Union 76 balls that were for decades that oil company’s identifying symbol. The orange globes, often referred to as “meatballs,” have turned into Southern California pop culture icons largely because of their longevity – they’ve been around for 59 years. Since ConocoPhillips bounced the balls from its ad campaign last year, they have started disappearing from West Coast highways and corner gas stations. At their peak in the 1960s, the 76 balls could be found on as many as 4,000 Union 76 gas stations from Seattle to San Diego. By some counts, the number of balls has dwindled to less than 300. When Kim Cooper and Nathan Marsak realized that their local gas station had carted off its giant 76 ball, they created a Web site – savethe76ball.com – featuring a tongue-in-cheek petition asking consumers to urge the Texas oil giant to stop dropping the ball. On the site, the bloggers claim ConocoPhillips is guilty of “design terrorism” for throwing out the “goodwill” associated with the 76 balls. Visitors can sign the petition and print a card urging remaining gas station owners to keep their balls. A spokeswoman for ConocoPhillips refused to comment. After Cooper launched the Web site last month, she was contacted by Ray Pedersen, who redesigned the orange logo in 1955 for Union Oil. Pedersen, who is well known in the advertising industry, also designed Yoplait’s distinctive yogurt containers. He conceived the orange ball as a futuristic globe that was to adorn a Union Oil ride at the Seattle World’s Fair. With that as the inspiration, he designed a “Spirit of 76” ad campaign. In 1967, when the company had become Unocal Corp., it launched a wildly popular promotion in which millions of small plastic balls were distributed at its gas stations to be attached to cars’ radio antennae. Today, a classic 76 antenna ball can be purchased on eBay for roughly $1.50. “The 76 balls are very urban and visually stunning,” said Cooper, who with Marsak writes for 1947project.blogspot, a day-by-day account of Los Angeles crime history from the era of the Black Dahlia. Marsak is author of “Los Angeles Neon,” and has developed an interest in vintage signs. What Are They Doing With The Balls? 76 Balls being destroyed in secret, artists needed to represent the horror! you people need to get a hobby, you have to much time on your hands to worry about a ball. It is just a stupid freakin ball!!! !